Some of the garage-replacing condos at 221 West 77th Street have been on the market for nearly six months now, and today, developer Naftali Group listed one of the remaining apartments—Townhouse West, a 3,800-square-foot duplex that’s asking $9.75 million—as well as released some renderings, exclusive to Curbed, of the outdoor spaces on some of the apartments. And they’re freaking huge. 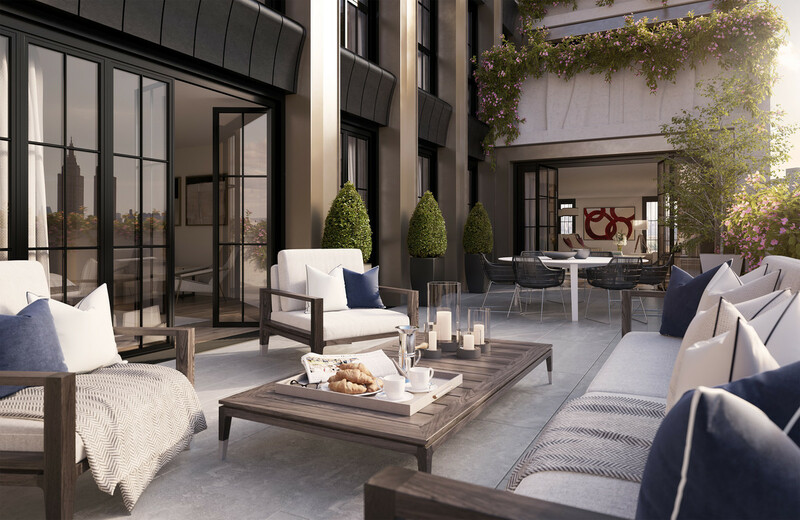 The apartment (which isn’t really a townhouse, but a duplex with townhouse-like proportions) has five bedrooms—all with en-suite bathrooms—a chef’s kitchen, and other snazzy features, but really, the 1,285-foot terrace (pictured above) is the star. There’s also a new rendering of a south-facing terrace on the 14th floor, which measures 1,300 square feet. It’s attached to what is currently the building’s priciest listing, a 3,493-square-foot apartment asking $12.75 million.